At the weekend we can slow down and take more time to prepare our breakfast (during the week, my only preference is for quick and easy). At the moment, one of my favourite breakfasts (or more usually brunch for me) is avocado on toast. It’s both delicious and nourishing. For an added extra, add a heart (as Valentine’s Day is coming up) shaped poached or fried egg and serve for you and your loved ones. Chop the lime in half. Peel and mash the avocado with the juice of half a lime, salt and pepper. Leave to one side. Fry each egg in a little oil in a heart shaped frying pan (this one is from Home Bargains). While the eggs fry, toast your bread (if the eggs take longer keep the toast warm). Spread the avocado mixture over each slice of bread. 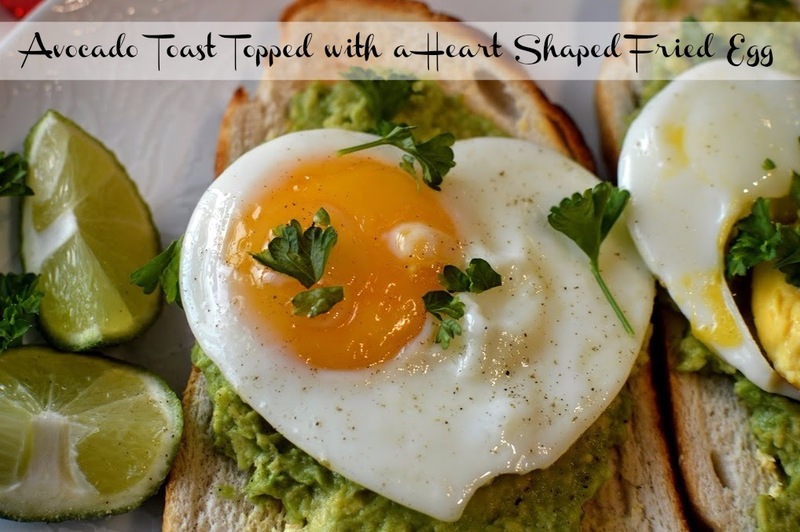 Top each slice of avocado toast with a heart shaped fried egg. Season with salt, pepper and chopped parsley. Garnish with the leftover lime. It’s so simple and these ingredients make such a perfect combination. This would make a lovely breakfast on Valentine’s Day, but of course can be enjoyed all year round (you can even use round shaped eggs if you prefer!). Serve with a Strawberry and Raspberry Smoothie.